Starting today, I'm debuting a new podcast series. Over the next few months, I'll be bringing you bi-weekly episodes of the Background Noise podcast series. The series puts the focus on street artists and the music that inspires them, the music they listen to while they work, or just straight up music they enjoy. First in the series is Harlem-bred artist Roycer. Also known to some as Choice Royce, or by his given name, Royce Bannon, Roycer has been a fixture in the NYC street art scene for quite a few years now. His signature faces have adorned many walls, stickers, tiles, skateboards, and doors, as well as collaborations with Tony Depew, Dark Cloud and more. He's been very active in the curation of art shows throughout the city, recently curating From The Street Up at Woodward Gallery, and SPECTRUM at Gallery Brooklyn. Once you see Roycer's art, you won't forget it. You will notice it everywhere. His cartoonish faces have morphed over the years from his more menacing creatures to his more innocent looking characters that can be seen more prominently today. I'm honored to start off the series with his contribution. A 41-minute mix featuring some classic New York Latin/Jazz/Soul tracks and more surprises. 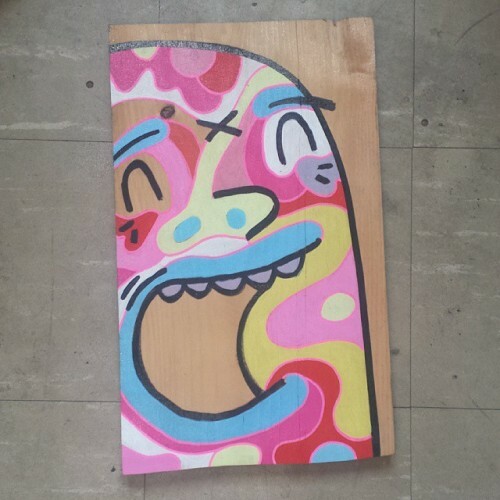 Check out more of Roycer's work on his Tumblr, or over on his Instagram. Stream the podcast below, or subscribe on iTunes or Mixcloud. And stay tuned for more podcasts in the series. Many great artists and music coming up.